Several DCI corps members and alums gathered at the Georgia Dome in January to attend the 2012 Passion Conference with 40,000 other college-aged students. This picture was taken below the "Freedom Statue," an art sculpture that we helped build to raise awareness of human trafficking and modern slavery. Drum corps represented were the Bluecoats, Blue Stars, Boston Crusaders, Carolina Crown, Colts, Crossmen, Glassmen, Madison Scouts, Memphis Sound, Phantom Regiment and Spirit. 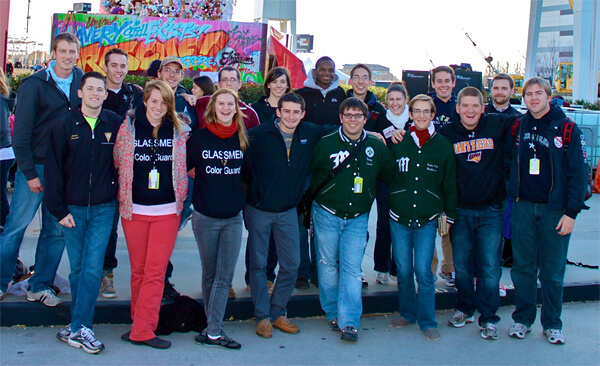 We plan to be back in Atlanta for Passion 2013, hopefully with many more DCI alumni!